Buy 1 for $16.03Buy 2 / Save $0.86!Buy 3 / Save $3.21! Size (inches): 1.89" X 1.89" X 4.21"
Burdock roots are traditionally used to help support gastrointestinal ailments but the herb has become almost obsolete recently. Externally, root or leaf extracts are used specffically for eczema and psoriasis, but also for acne, skin infection, wounds, dermatosis, furunculosis, itches, insect bites and other ailments. Claims have been made that it stimulates hair growth, but this appears to be based on the doctrine of signatures (that the herb will somehow transfer its powers of hairiness to humans). Arctium lappa L. (= A. majus Bernh.). Other Names: Greater burdock; gouteron, grateron (French); Große Klein (German); bardana (Italian); bardana (Spanish). Description: Great burdock is a robust biennial weed with large leaves and rounded purple flower heads surrounded by bristly, hooked bracts. Three other species are sometimes used as a source of raw material: A. minus, A. tomantosum and A. nemorosum. Origin: Arctium lappa is indigenous to Europe, and introduced to northern Asia and North America. It is sometimes cultivated for its edible roots and leaves. Supplies of raw material come mainly from eastern Europe. Parts Used: Mainly the dried roots (Bardanae radix), sometimes also the leaves and fruits. Therapeutic Category: Diuretic, skin disorders. Active Ingredients: Various types ofpolyacetylenes are present in roots: sulphur-containing heterocyclic acetylemc compounds such as arcunal and lappaphens and several sulphur-free compounds. Roots also contain essential oil (with benzaldehyde, acetaldehyde and pyrazine derivatives), large quantities of inulin, triterpenes and numerous other minor constituents. Leaves contain a bitter germacranolide type sesquiterpenoid lactone, arctiopicrin. Fruits are rich in lignans. Health Effects: The roots and leaves are thought to have hypoglycaemic and diuretic activities. A wide range of biochemical activities has been reported including PAF antagonism, inhibition of cAMP phosphodiesterase, and antimicrobial and anti-inflammatory properties. Some of these activities can be explained by the presence of lignans and polyacetylenes. Notes: The fibrous roots are eaten in Japan (gobo). Young leaves are eaten as salad. Preparation and Dosage: A cold infusion of the root is made for internal use, while the root oil or powdered leaves are applied externally as emollient. 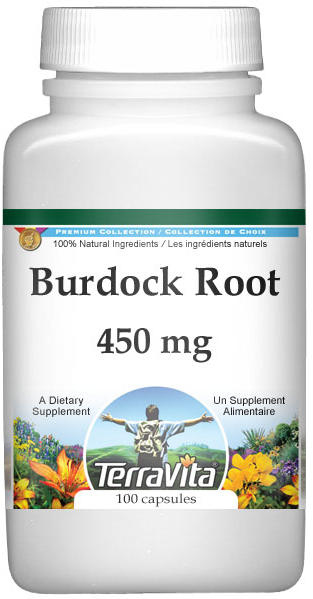 Burdock root is an ingredient of powders, tablets and liquid extracts sold for skin complaints and joint pain. Burdock usage can interfere with iron absorption.